We’re a bit obsessed with the weather here in the UK but I have to say what a wonderful month of weather we’ve been having this July. It was especially nice delivering our latest Sticky Fingers Cake Co wedding cake to the gorgeous Braxted Park last Thursday where Alison and Chris were married. The most wonderful thing about setting up a wedding cake is stepping back after it’s set it up, looking around at all the decoration and the lovely flowers then looking back at the cake and seeing that it all fits in beautifully. 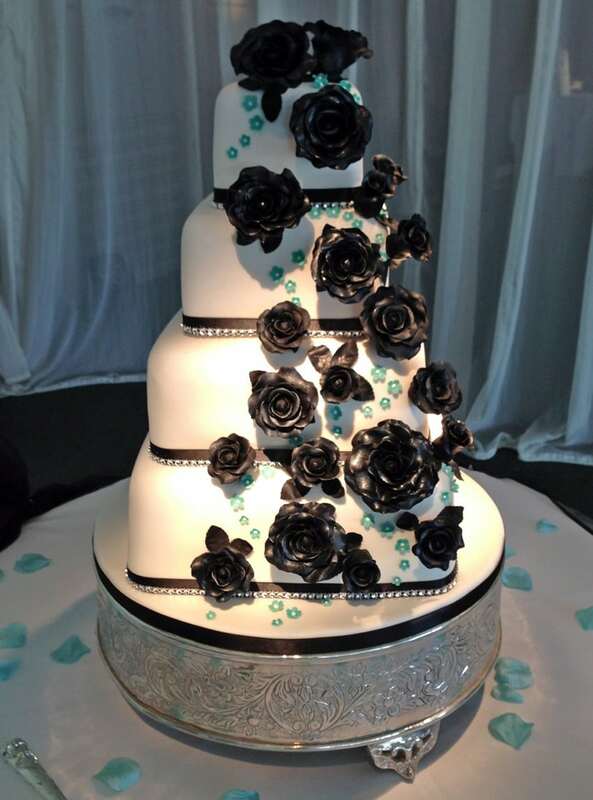 They chose black and white with a touch of Tiffany blue as their colour scheme with roses being the prominent flower, so I designed a cake that took in all these elements, the result being a 4 tier white square cake with tumbling black sugar roses and tiny Tiffany blue blossoms. Inside, the flavours were our Dark Chocolate cake and our new Red Velvet sponge cake, which went down very well! Remember I want to make you a really lovely wedding cake that complements and interprets the style of your day, so when you have your consultation with us feel free to bring along anything that can help inspire me, for example colour swatches, your invitations, flower ideas… or anything else you have in your head!